Team Updates and other athletechs email notifications are sent from notify@athletechs.com on behalf of the sender. For the majority of email clients, when the recipient receives the email and clicks reply, the reply email is sent to the "reply-to" email address as intended. But in a very few cases, the email address is sent back to the "from" address and ends up in the notify@athletechs.com mailbox. When we receive these emails we will forward them on. When replying to an email, if the email is addressed to notify@athletechs.com you can always change this to the email address of the sender. DMARC (Domain-based Message Authentication, Reporting & Conformance) is an email rejection policy that ensures emails sent with a from address such as @yahoo.com originate from a Yahoo server. This is why all athletechs Email Notifications have a from address of “notify@athletechs.com” and the from name of the sender. When you reply to an athletechs Email Notification you’ll see that the reply email is not addressed to “support@athletechs.com” but rather the email address of the actual sender of the email. Note: A very small number of email clients and Out of Office Replies do not honor the “reply-to” header and in this case replies will be sent to notify@athletechs.com and they sender will receive the following response. 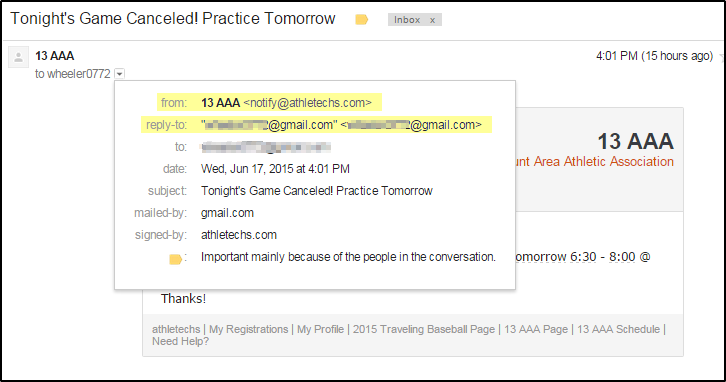 You have sent an email to no-reply@athletechs.com Most often this occurs due to an out of office reply or replying to an email that was sent from athletechs on behalf of a provider, team, or administrator. Please double-check the reply to address of the original email. If the email is addressed to "no-reply@athletechs.com" when clicking reply your email client is not honoring the reply-to SMTP header and you will need to manually enter the intended recipients email. Please see the athletechs Email Notifications for more information.